Tea is fast becoming one of the most popular drinks in the world. Tea tastes excellent, and it is a very versatile drink, but it is also extremely healthy for you as well. Many people understand the health benefits of tea, including Chinese cultures, Japanese cultures, Europeans, Taiwanese and African cultures. Health conscious citizens in America are just now beginning to understand the health be… nefits of tea, and the fact that drinking tea or consuming tea in other forms can be one of the best things that you can do in order to benefit your body. 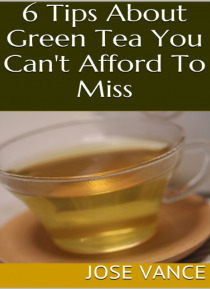 In this ebook, you'll find helpful tips on:-6 Things You Must Know About Green Tea-The Best Things About Green Tea-What You Need to Know About Green Tea Pills-And MoreGRAB A COPY TODAY!